Mother Africa, Khayelitsha – My Home brought a burst of sunshine to a miserable, wet February evening. 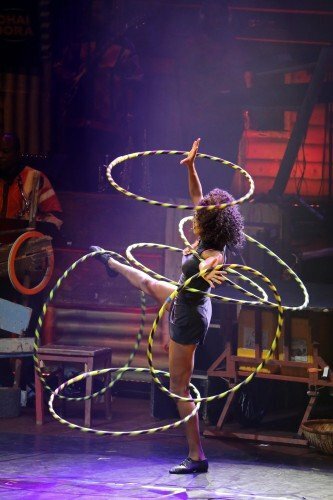 A troupe of ridiculously talented performers offers a taste of African life played out in a street market atmosphere throbbing with music and dance and liberally sprinkled with breath-taking circus tricks. Mohamed Tadei Mohamed, a regular charmer, kept piling on the challenges in his Rolla Rolla balancing act, while never losing his smile. 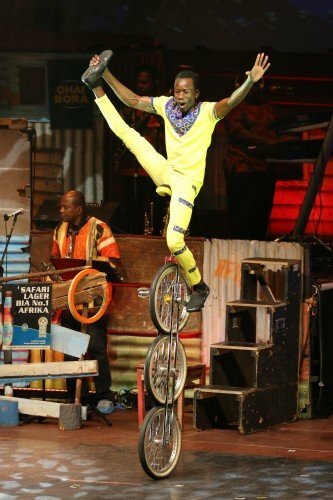 Baraka Juma Ferouz, also from Tanzania, rides a bicycle like no other from the tiniest miniature to mountain high and carried the audience at every height. 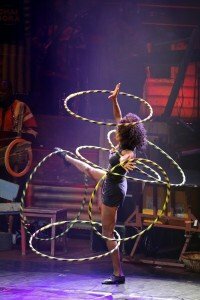 The final act was a bit of human juggling, eyewatering in its precision and daring. The two men, one laid back to form a solid base, balanced the smaller guy on his feet and literally flipped him like a pancake. After that it could only be topped by the dance finale. However, the simpler acts had their own charm enhanced by the charisma of the performers. A hat juggling duo, Abere Alemayehu Debebe and Firehiwot Bayelgn Tefera both from Ethiopia, was my favourite. The many straw hats seemed to have a life of their own as they switched between heads, elbows and hands as precise and regular as clockwork. The pair showed their skill at juggling, easy, rhythmic and oh so clever, all the while seeming to take as much joy in performing as we had in watching. Hailing from countries like Ethiopia, Tanzania, Zimbabwe and South Africa, that have more than their share of poverty and violence, the performers approach life with an artlessness that we in the satiated West seem to have lost. They live in the moment so completely and give their all. The dance is first rate, the tautness in the bodies making the pulsing rhythm riveting to watch and spiced with street and break moves. The band are arranged at various levels to provide colour and dynamics and an occasional song to link the acts and cement the whole. The concept comes from Winston Ruddle and Hubert Schober with Ruddle’s name also linked to choreography, music and props, heading a list of creative artists. The enthusiastic audience proved this one a winner.